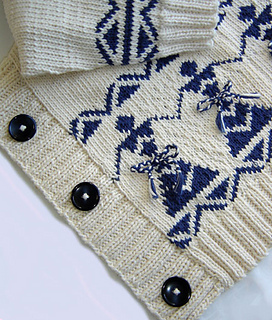 A maddy laine knitting pattern for a close-fitting cardigan in a cropped length, accented with deep k2, p2 rib, a stand-up collar, and set-in sleeves. The knitting pattern is a good introduction to charted color knitting as there are just two colors to work. 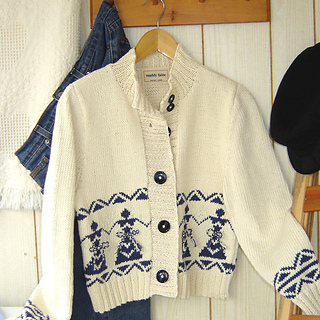 This is a great little sweater to wear with a pair of jeans and add a little ‘folklorico’ to your wardrobe. The knitting pattern, written in both US and metric measurements, includes a color chart and full intructions to make the braided ties. Sign up for the maddycraft Newsletter and be the first to know when new patterns are released, along with complimentary knitting projects, tips, and news.